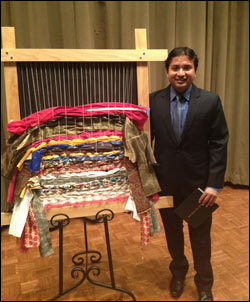 Nimish Dharmadhikari, Ph.D. student in the NDSU Transportation and Logistics Program and graduate research assistant at NDSU's Upper Great Plains Transportation Institute, was recently inducted into the Tapestry of Diverse Talents at NDSU. The Tapestry of Diverse Talents is a pictorial mosaic that recognizes NDSU students, staff, faculty, and alumni for the contributions and diversity they bring to the university. The program is designed expand diversity on campus. At NDSU, Dharmadhikari has participated in the ICORE program by volunteering to help new international students participate in Orientation Week, mentored new students in NDSU's summer intensive English learning program, and joined the Global Ambassador program in the Office of International Programs. He took part in NDSU Memorial Union's Masters of Success leadership program and was also elected the vice president of the Graduate Student Association in the 2011-2012 school year and president the following year. As president, Dharmadhikari and the Graduate Student Association worked to expand graduate students' diversity programs. He later went on to organize a Graduate Research and Arts Forum to display research accomplishments of fellow NDSU graduate students.